Poseidon Oil Pipeline Company, L.L.C. ("Poseidon") is a proprietary crude oil pipeline system that was built in response to increased demand for additional crude oil pipeline capacity in the Gulf of Mexico. 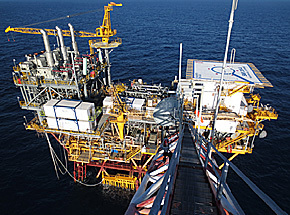 Poseidon's mission is to be the preferred, strategic link for central Gulf of Mexico oil to key markets in Louisiana. Poseidon provides the combination of flexible, reliable gathering and delivery options and professional, streamlined customer responsiveness that makes Poseidon the preferred pipeline option. The western side of the Poseidon system begins at the Garden Banks 72 "A" platform ("GB 72A") and runs easterly along the Outer Continental Shelf to the Poseidon-owned South Marsh Island 205 "A" platform ("SM 205A"). Poseidon operates a bi-directional pipeline between SM 205A and the Ship Shoal 332 "A" platform ("SS 332A"). At SS 332A, the Poseidon system turns northward and delivers into Shell Pipeline tankage at Houma, Louisiana. See the System Map page for a complete list of the pipe diameters and mileages for each segment of the Poseidon system. In 2014, Poseidon completed a major upgrade of the SM 205 platform which included the addition of three 60,000 bopd pumps capable of use for deliveries to Houma, KC 875 and/or into the Auger pipeline. In addition the platform underwent extensive upgrades with pile inserts, removal of abandoned production equipment, structural reinforcement, new power generators, a gas fuel supply, increased manning facilities and total platform repainting. At the SS 332A platform, Poseidon added one 150,000 bopd pump to add to the existing two 150,000 bopd third party pumps under contract to Poseidon. Additional enhancements for flow assurance are under review by Poseidon. For barrels on the west side of the Poseidon system and for certain barrels at SS 332A, Poseidon can deliver oil into SPC’s Auger Pipeline via SM 205A in addition to receiving oil from Auger if needed. Refer to the System Map page. Poseidon is owned 64% Genesis Energy, L.P. who currently serves as operator and 36% by Shell Midstream Partners, L.P.